Goldenrod is still blooming at C&L. 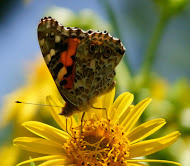 It is a goldmine of goodness in any garden~~A protein rich pollen and good sugar nectar source for visiting critters. They are still flocking to its golden goodness.... Bees of every sort, wasps, moths and even predators have staked a claim and a space on the last of the flower clusters. They've come to drink nectar, collect pollen, nibble leaves and stems, prey on other insects, or lay eggs. turned to fluffy seeds that will soon be blown about the garden. the last stop for many on the journey to winter. Warmest thoughts of you all~~Have a good weekend and thank you for stopping by. Great post Gail. I have bees sleeping all over my flowers in the morning. Surely a pollen induced hang-over! Your poem is so apt Gail. The photos are now reminders to me that I need to thin out my goldenrod. It is taking over its garden bed. That isn't all bad in the case where it is but I am ready to move some of it. Beautiful photos. I hope you have a great weekend too. The bumbles really love to sleep on fluffy flowers. Lovely photos. I still have so many salvias in bloom, even with this morning's freeze. The azaleas and roses are still blooming like crazy, too. Even a few echinacea are still opening new blooms. Sometimes, this full sun microclimate is pretty nice. You have a great day too. The goldenrod is so lovely. I love the goldenrod at this time of the year. This fall I added another variety and it is still blooming it's heart out. The sleepy bee is a common occurence here on cool mornings. Great shot! Our goldenrod has faded to seed. Nice pictures! We have one chilly morning this morning! How delightful, Gail! Our goldenrod is now all in seed, and only the later asters, a few hardy geraniums, and our monkshood are still in bloom. I envy you that ongoing touch of gold! I think I have a new name for you... The Bee Whisperer. Goldenrods are super this time of year....still great color. I love the bee in the hand picture. Were you brave enough to pet the bee? Hi Gail, I envy you your long growing season. In my garden there are 4 varieties of golden rod and all are relatively early blooming. It's a favorite plant of mine too--because of the insects and also because it is so beautiful. I have goldenrod a-plenty here, none of it planted by me. Of course, it is the wild/weed variety, but I love it just the same. Even as it fades, it has a certain beauty, swaying in the breezes. I'm glad that people realize it's not the allergy-inducer people once thought it was. So good to see all the bees still in your garden! I'm afraid all of mine have left for the winter. Have a good weekend! Lovely photos and fitting words to match. I have never been so brave as to hold a bee, but I can see how natural it could--well--bee. Sorry, I couldn't help myself. I must find some Goldenrod for the garden. It is so striking and works well with so many other plantings. Not to mention is gorgeous in cut flower arrangements. Hope your weekend is sunny and restful. Hi Gail....I do love Goldenrod....such a stately plant. I thought of you today Gail....do you remember I bought a 'Susan' late in the summer....today it bloomed....just one little flower......how perfect is that? Several years ago, I was annoyed to find that I'd left goldenrod instead of phlox paniculata in a corner of the garden - how very similar they are in the spring. I was about to yank it all out when I saw the creatures stomping about on the flowers and realized what a treasure I had. While it can be a bit invasive, I really feel I've added a buffet section to my fall garden. It was my first effort with goldenrod this year and even though the plant provides little beauty the rest of the year it is a keeper. I've NEVER seen so many flying critters on any one plant. You have captured the magic of the golden beauties perfectly. As well as all its visitors and the feeling the gardener has when observing it. Looks like there's a bit of competition for space on your goldenrods there, Gail! Alas ours has petered away. What kind of moth (?) is that with the white and orange pattern? It's really stunning! Lovely post Gail. That first picture is especially outstanding. I don't care how many photos I look at on other blogs today, none of them will beat the first photo in this post. You really need to frame it. Goldenrod brightens up the world, doesn't it? My best friend lives in Franklin, TN. Is that near you? I luv TN. A very pretty state. It's great that your goldenrod is still blooming! Mine has been seedheads for quite a while now. 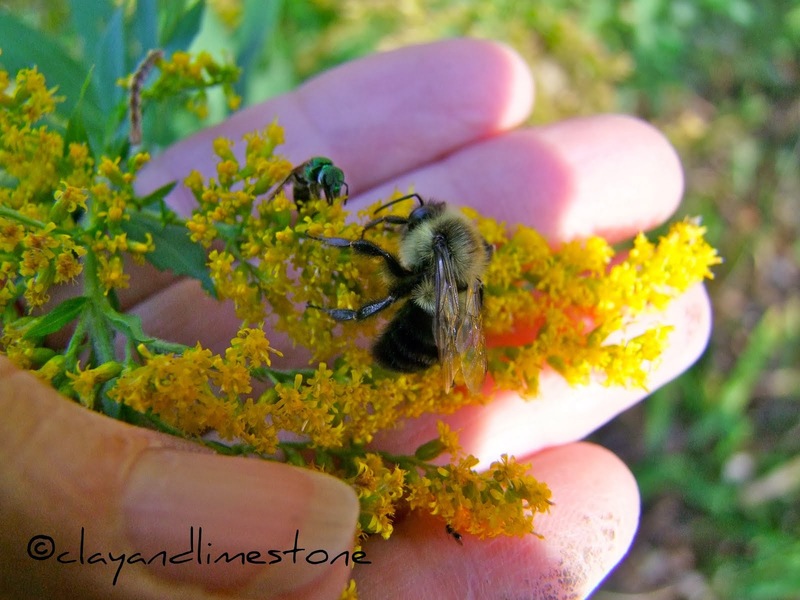 The bright yellow of the goldenrod with the bees visiting made me feel warm. It's been so rainy and dark here that there hasn't been much bee activity in the garden. Thanks for sharing such pretty pictures! Hi Gail, I cannot believe you were practically holding a bee! To hold or not to hold, that is the question... Please Bee Careful there, young lady! such lovely bees...that one critter looks like it has painted flowers on it. lovely post. I think Janet is right ~ you are the "Bee Whisperer!" I am not so brave. I also need to rethink/research goldenrod. I've never planted it because of my already terrible fall allergies. I've always thought (maybe incorrectly) it might contribute to them??? Anything that attractive to insects is fantastic tho and deserves consideration. Have a great weekend too Gail. PS I know what you mean about hesitating to congratulate on moving up a zone. I almost wrote something about that in my post. Although it's exciting on the plant level, it's bittersweet because of implications at other levels. I do my best to limit my contributions to global climate change too. Well, I better get over to blotanical soon, and get this post picked. I loved the words and photos! Cool, cool, cool! I don't deadhead goldenrod that I can recall, because I'm thinking I've read that it won't rebloom. I wonder if that is right, though, because I have a few more blooms coming along, even though the rest have all faded. I have found that different kinds of bees, wasps, and other insects seem to share well on the blooms. I posted about that last year, but don't remember what I said. "The hand becomes the flower" -- that line resonated (buzzed?) in my head all through your post and all the comments. Lovely. Love the play on "becomes". Oh Gail, you are so brave to pet the bees! I've thought of you when I saw a sleeping bee, and was tempted to touch him. But I chickened out! I have not seen as much goldenrod around here as I usually do--must have been the rainy summer. 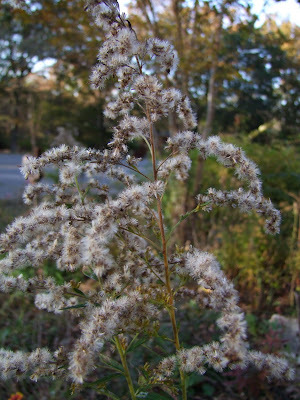 It is a great plant and unfairly characterized as an allergy menace. A Bee-utiful look at goldenrod! Here it has turned to fluff.